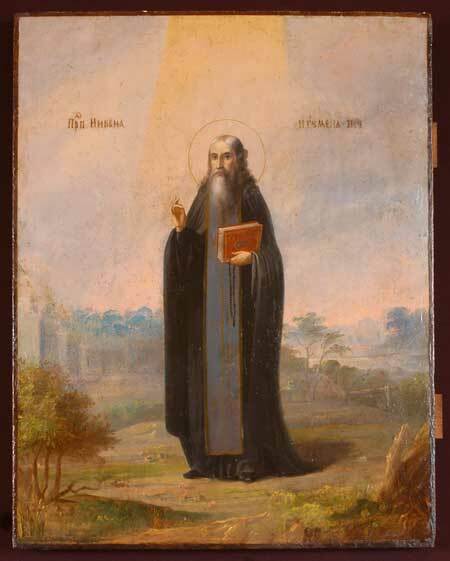 Saint Nikon of the Kiev Caves was the first disciple and fellow-ascetic of Saint Anthony (July 10), the founder of the Kiev Caves monastery, to which he came as a priest. At the monastery he tonsured all the new monks, and among their number was Saint Theodosius of the Caves (May 3 and August 14). For tonsuring the favorites of the Great Prince Izyaslav, Saints Barlaam (November 19) and Ephraim (January 28 ), Saint Nikon brought the wrath of the prince down upon himself, but he refused to force the new monks to leave the monastery. The princess calmed Izyaslav, and he left Saint Nikon in peace. When he returned to the Kiev Caves monastery, Saint Nikon was obedient to Saint Theodosius as his spiritual Father. According to Saint Nestor the Chronicler (October 27), when Saint Theodosius had to go somewhere, he entrusted all the brethren to the care of Saint Nikon. Sometimes he asked Saint Nikon to offer instruction to the brethren in place of himself. Often, when Saint Nikon was binding books, Saint Theodosius sat near him and spun the thread for the binding. When Prince Svyatoslav drove out his brother Izyaslav from Kiev, Saint Nikon returned to the monastery he founded. He returned under the igumen Stephen. When Saint Stephen (April 27) left the Kiev Caves monastery, Saint Nikon was chosen as igumen of the monastery. He toiled much to adorn his monastery with spiritual books and icons. He died at a great old age (+ 1088) and was buried in the Near Caves of Saint Anthony. Послушания добрый рачитель быв,/ преподобне Никоне приснопамятне,/ церковь бо пречудну Пресвятыя Богородицы/ прекрасно украсил еси./ Темже и мы, чада твоя, любовию вопием ти:/ слава Давшему ти крепость,/ слава Венчавшему тя,/ слава Действующему тобою всем исцеления. Духовному твоему наставнику, отче Никоне, всячески прилепився/ и от него наставляемь,/ во всем Христови поработився,/ монахов был еси чиноначальник и преподобных сожитель,/ с нимиже Христа Бога моли непрестанно о всех нас.